Portions of this review can be found in Shannon T. Nutt's coverage of 'Teenage Mutant Ninja Turtles - 3D' (2014). Critics were frothing at the mouth waiting to pan the Michael Bay-produced/Megan Fox-featured 'Teenage Mutant Ninja Turtles' reboot when it was released in theaters earlier this year. After all, this was one of the most disliked (at least as far as his movies are concerned) directors in Hollywood (even though he didn't direct this movie) along with one of the most maligned actresses (at least as far as her acting is concerned). It was the perfect storm for film bashing, and sure enough, most reviewers had a field day commenting about how Bay had been responsible for launching another mindless movie franchise and/or how Fox's performance was wooden and lifeless. I have two responses to the above. The first being what exactly did critics expect from a movie about talking turtles who live in a sewer, eat pizza, and fight crime? This wasn't exactly a project that was going to find Martin Scorsese and/or Tom Hanks attached to it, was it? But secondly, and perhaps most importantly, this movie isn't as bad as you've been led to believe. In fact, for a film of this nature, it's about as good as we could have hoped for. And for a film with the names Michael Bay and Megan Fox in the credits, it's right near the top of their resumes. Almost from the first frame, it's obvious that Director Jonathan Liebesman wants to give fans a more 'realistic' version of the Turtles, who are no longer the cute, kid-friendly foursome they were in the films from the 1990s. Well, at least not physically, as these CGI renderings (which were created with help from live actors using motion-capture technology) are much more dangerous looking…not to mention larger, each standing over six feet in height. But rest assured that much of the humor is still present, and the movie does a remarkable job of creating distinct and identifiable personalities for the four Turtles, even though (minus the different colored masks and weapons of choice) they're pretty much identical to one another in appearance. The actual plot of the movie is really the weakest part here, as the Turtles have to take on an evil group of ninjas called 'The Foot Clan' along with their leader, Shredder (Tohoru Masamune), who fans of the comic books, cartoons, and previous movies already know to be the Turtles' primary baddie (he's kind of the Darth Vader of this universe). In addition to Shredder and his ninjas, there's an evil industrialist, Eric Sachs (played by William Fichtner), who is both working for Shredder and is partially responsible for the actual creation of the Turtles into their teenage mutant ninja selves. In between the action sequences (most of them about 90 percent CGI, but unlike most we see in films these days, actually well-storyboarded so we're never confused about who's doing what to whom), much of the story deals with the origin of the Turtles and their rodent teacher, Splinter (voiced by Tony Shalhoub). In a little revisionist history that may or may not upset loyal fans, it is revealed that April's father (now deceased) was working with Sachs and responsible for the transformation of the Turtles, whom we learn were actually pets of April's when she was a little girl. While some fans may be up in arms about that change in backstory, I personally thought it added an interesting level to the relationship between the foursome and Ms. O'Neil. While we're on the subject of April O'Neil, it's impressive how much of this movie Megan Fox has been asked to carry. She's far and away the lead role here, and considering her history of less-than-impressive performances, you actually have to give kudos to both Paramount Pictures and Jonathan Liebesman for trusting her to headline what was one of the studio's big tentpole movies of 2014. Now, I'm not going to tell you that Fox gives a performance for the ages, or that all her scenes are great – but she does hold her own, and certainly doesn't do anything to embarrass herself. It's far from one of the best performances of the year, but it's certainly one of her best performances, and I give her credit for that. 'Teenage Mutant Ninja Turtles' still has a lot of problems, the biggest of which is that it doesn't give us nearly an interesting enough story to allow for much emotional attachment to what's transpiring on the screen. There's a lot of 'going through the motions' here, as basically the plot just serves to introduce us to the various characters and their backgrounds. Still, I've seen a lot worse origin movies in the history of superhero flicks, and while I may not be re-watching 'Teenage Mutant Ninja Turtles' anytime soon, I can't say that I wouldn't want to see these characters on screen again in the near future. In short, this movie does exactly what it sets out to do…no more – but no less, either. Paramount Home Entertainment brings 'Teenage Mutant Ninja Turtles (2014)' to Blu-ray as a two-disc combo pack with a flyer for an UltraViolet Digital Copy. The Region Free, BD50 disc is housed inside a blue eco-elite case with a DVD-9 on the opposing panel and a glossy, lightly-embossed slipcover. At startup, the disc commences with a trio of skippable trailers before switching to an animated comic-book style menu screen and music playing in the background. Fans also have a choice of a 3D Combo Pack and other retail-exclusive packages. For this Dolby Atmos-specific review, we look at the 2D pack. The heroes in a half shell shred the screen with a stunning, reference-quality 1080p/AVC MPEG-4 encode that will have videophiles foaming and frothing at the mouth. Shot digitally, Lula Carvalho's cinematography is nothing short than astounding, brimming with clarity and sharp, brilliant contrast. Background information, no matter how small, is clear in the distance, and whites are comfortably bright throughout. Sumptuous, opulent blacks bathe the picture with dark, penetrating shadows and excellent gradations, providing the presentation with a lovely cinematic appeal and dimensionality. Despite the orange-and-teal palette, luxurious, richly-saturated primaries and warm, accurate secondary hues bring every CG moment to life and surprising realism. Presented in a 2.40:1 aspect ratio, the digital-to-digital transfer also shows striking definition and resolution in every frame, revealing the tiniest, most miniscule detail in the computer-generated images. One can truly appreciate the talent and effort that went into making the fictional characters when every line, wrinkle and blemish in their faces practically looks as real as those in the facial complexions of others. Especially in close-ups, pores are plainly visible, threading in the costumes is exposed, and the minutest of debris is made crystal-clear and distinct. In the end, this is a superb debut for the mutant turtles to show their ninja skills. Following in the heels of 'Transformers: Age of Extinction' and 'The Expendables 3,' the crime-fighting turtles party home theaters with an awesome Dolby Atmos soundtrack, which reverts to a standard Dolby TrueHD 7.1 track for those unequipped for the new codec. I only recently made the upgrade myself to a 7.2.4 configuration — two subwoofers and four B&W CCM683 ceilings overhead speakers. I listened using a Denon AVR-X5200W receiver and an Emotiva UPA-200 stereo power amplifier for the two overheads behind the seating area. From the start, the listener can tell they are in for a fun, shell-shocking ride as the animated panel-like prologue litters the screen. While Splinter briefly narrates some background info, the sound of pages fling and flutter through the air as if thrown across the room and the turtles' weapons ring and swoosh from the front to the back as if threatening to hit the viewer on the head. Later, when our shelled heroes are finally introduced in the subway fight, around the 19 minute mark, high kicks swing, bodies fly through the air, weapons whirl about and screams and grunts fill the room. Another notable moment is the Shredder versus Splinter fight, starting at 52 minutes in, when the Foot Clan invades the turtles' sewer hideout. Of course, the sequences that truly show off the track's potential are in the movie's second half, especially the mountain slide and avalanche scene that starts at the 1:11:00 mark. 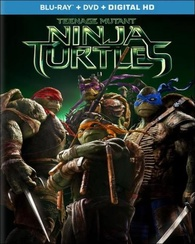 After saving Leo, Donnie and Mikey, the turtles, April and Vern escape on a semi-trailer truck that ends up sliding down a snowy mountain while chased by Karai and the Foot Clan. The trailer swings from left to right and back again right above the listener while the other vehicles crash and fly overhead with extraordinary fluidity and convincing realism. The final fight scene against Shredder at the 1:19:00 mark is another excellent highlight, particular when the turtles decide to play buck-buck and debris from Shredder's helmet sprinkles overhead with distinct clarity and flawless panning from the front to the back. As for the rest of the design, it's needless to say this remains a reference quality lossless mix, filling the room with voices, screams and lots of pounding action in almost every scene. Rear activity is nearly constant with subtle atmospherics, like traffic city noise, and the score of Brian Tyler supplying the tension and excitement, which also benefits greatly from the Atmos codec delivering music overhead. Imaging is broad and expansive with outstanding movement and spotless channel separation thanks to a crisp, detailed mid-range that keeps the action distinct and crystal-clear at all times. The low-end is not as robust and dynamic as I would have liked, but it's nonetheless weighty and vigorous, adding a hearty punch to the action sequences. With clean, very well-prioritized vocals in the center, the Dolby Atmos track is a remarkable mix that will truly demonstrate the capabilities of one's audio system, creating a consistently immersive 360° soundfield that excites and engages. All the special features are exclusive to Blu-ray. Despite being the typical Michael Bay bloated bombast style of filmmaking, the 'Teenage Mutant Ninja Turtles' deliver a surprisingly decent piece of action entertainment. Oozing with CG spectacle and other grandiose sequences of visual delights, the reboot to a long-dead franchise is good starting point that fans will probably find satisfying while also attracting a new, younger fanbase. The Blu-ray arrives with stunning, reference picture and an awesomely immersive, demo-quality Dolby Atmos mix that'll leave audiophiles drooling. Although exclusive, supplements are still on the weak side, yet the overall package is worth a look for the curious, especially for the audio, and sure purchase for fans.